Platoon, division, battalion, regiment, squadron, company, army corps - these are all military unit designations that the genealogist or historian will encounter when conducting research on an individual who served in the military. Although those terms have been in use for hundreds of years and in many cases are still current, they take on different meanings over time, which complicates things even further, especially for the researcher who is neither a military historian nor a former soldier. With the 150th Anniversary of the Civil War upon us, more and more people will be looking for family links to the conflict, and finding them. An accurate interpretation of an individual's service, and a necessity in any attempt to gain further information on his wartime experience, is often complicated by a lack of understanding of the actual unit in which he served. This essay will provide the researcher with a basic knowledge of the basic Union Army military organizations and the ranks of the men who served in and commanded them. It is best to start from the bottom up. Although the platoon, a subdivision of the modern infantry company, was recognized as an ad-hoc tactical organization during the Civil War, it was not a formal unit, as it is today. For all practical purposes, the company, recruited at an original strength of approximately 100 men, was the building block of both Union and Confederate armies. Ten companies (occasionally as many as twelve) usually comprised an infantry regiment, which had a nominal strength of around 1,000 officers and men. In actual service, however, due to deaths in combat and by disease, discharges for various reasons, including disability, and the absence of soldiers on detached duty, combined with an ineffective replacement system, left the actual field strength of a regiment after a year or so of service at around 300 - 400 men, with the average company mustering between 30 and 40 soldiers. Most Civil War soldiers were infantrymen, and most infantry regiments, initially composed entirely of volunteers, were designated by a number, the state they were raised in and their branch of service - for example, 1st Indiana Volunteer Infantry, 3rd New Jersey Volunteer Infantry, 85th New York Infantry, etc. Companies within the regiments were designated by letter, A through K, in a typical ten company regiment. There was no J Company because the letter looked too much like an I in the handwriting of the era. Captain Charles Curie, 178th New York Volunteer Infantry. The two bars on his shoulder straps indicate his rank of captain. Curie became a prominent tariff attorney in New York City after the war. Although the United States regular army recruited men in the Civil War, with regiments designated as, for example, the 10th United States Infantry, the vast majority of volunteer soldiers served in state identified regiments. Notable exceptions did occur, including the 1st and 2nd United States Sharpshooter regiments, which were composed of volunteers recruited by company from several different states and the late war (early 1865) Veteran Volunteers, which were also composed of men from a number of states. The state-identified volunteer regiment was, however, the most common Civil War unit, North or South. Units were commanded by commissioned officers. A captain, assisted by a 1st and 2nd lieutenant, commanded an infantry company, and a colonel commanded a regiment. The regimental headquarters staff included a lieutenant colonel and a major, as well as an adjutant, who was a 1st lieutenant. The lieutenant colonel and major assisted the colonel and would replace him if he were disabled or killed. Due to casualties and other absences, units were often commanded by officers of lesser rank than initially authorized. A lieutenant colonel or major could end up commanding a regiment, and a first or second lieutenant often commanded a company. Regimental staff offices included a lieutenant who served as the adjutant and was responsible for maintaining reports and other paperwork, another lieutenant who was a quartermaster in charge of supplies and food, a chaplain (paid as a captain but with no command responsibility) and a surgeon. The surgeon and assistant surgeon, who were paid at the same rates as a major and a captain, did not hold command positions. The vast majority of enlisted men were privates, but a number were selected as non-commissioned officers, who assisted the commissioned officers in running the company and regiment. Each company had eight corporals and, above them, four sergeants and a first sergeant, the latter often referred to as an "orderly sergeant." At headquarters, noncommissioned officers included the sergeant major, the regiment's highest ranking noncommissioned officer, who assisted the adjutant, quartermaster and commissary sergeants who assisted the quartermaster in distributing supplies and food, a hospital steward who assisted the surgeon and a drum major and principal musician who would instruct and lead the regimental fife and drum corps. Each company was authorized two musicians, who played drums, fifes and bugles and were trained and led by their own noncommissioned officers. Only a few regiments had formal bands. In the cavalry, as in the infantry, the regiment was the standard organization. Cavalry regiments had a similar structure to infantry regiments, with either ten or twelve companies, although the companies were often grouped two together as a squadron in tactical situations. Cavalry regiments were also authorized additional commissioned and non-commissioned personnel, such as veterinary surgeons, veterinary sergeants, saddlers and "farriers," or blacksmiths. The highest ranking musician in a cavalry outfit was called the "chief bugler" rather than drum major. Twelve-company cavalry regiments were usually split into three battalions of four companies or two squadrons each, and had additional majors and non-commissioned staff, including sergeant majors, commissary sergeants, and veterinary sergeants. The basic Union artillery formation was the battery, a much smaller organization than an infantry or cavalry regiment, and more comparable to the infantry or cavalry company. The battery was usually commanded by a captain and mustered 120 to 140 or so men, with 12 sergeants and up to four lieutenants. Each battery was authorized six artillery pieces, further divided into three 2-gun sections, although later in the war many batteries were reduced to four guns. Non-commissioned officers in an artillery batter included a first sergeant, a quartermaster sergeant and up to 12 sergeants and corporals. Although Confederate artillery batteries were further assigned to battalions, Union artillery batteries were usually attached to larger infantry formations, from brigade to division. Later in the war the Army of the Potomac, for one, established an "Artillery Reserve" which was used to reinforce the army's line where necessary. 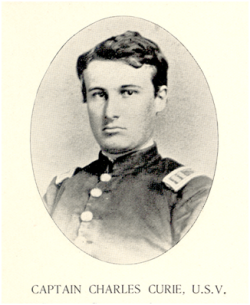 Corporal William Holzworth, 87th Pennsylvania Volunteer Infantry. His rank is indicated by the two stripes on his coat sleeves. Note the 6th Army Corps cross badge on his coat. Holzworth lived in Gettysburg and after the war owned a livery stable in Gettysburg and was an early battlefield tour guide. (Courtesy of Erik Dorr, Gettysburg Museum of History). Infantry and cavalry regiments were grouped in brigades, usually four to a brigade early in the war. As the conflict continued and casualties soared, brigades often contained six, eight or even ten under strength regiments. Most brigades were composed of regiments from different states, although a few, like the First New Jersey Brigade, were made up of regiments from the same state throughout the war. The Army of the Potomac's "Iron Brigade" was composed of soldiers not from the same state, but region, in this case the Midwest. A division usually included three brigades, but occasionally more, and there were usually three divisions to a corps. Several corps were combined to produce an army, which was usually named after a river, ie: Army of the Potomac, or the Army of the Shenandoah or the Army of the Ohio. You can quickly determine the combat theater where an army fought its battles by is river designation. From 1863 on many Union army corps, beginning in the army of the Potomac and spreading to the armies in the west, wore distinctive badges, usually colored red for the first division, white for the second and blue for the third. The badges became morale boosters. In the army of the Potomac, the Second army Corps used a trefoil as a badge, and the soldiers of those units often charged yelling "Clubs are trumps." Demonstrating their corps loyalty long after the war, Veterans often used corps badges as insignia on their reunion badges. 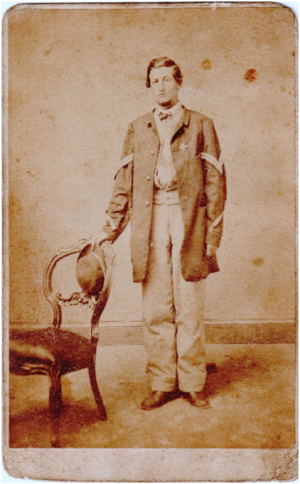 The presence of corps badges in soldier or veteran photographs of soldiers are often useful in identification of the individual in the picture. So there you have it, a basic primer on the Union army's organization. So when you come across an individual who is described in military service or pension records as having served in, say, Company B of the 71st New York Volunteer Infantry in the Army of the Potomac's Third Army Corps, you can pretty easily locate where he was at any given time by consulting a general history of the Civil War.